Et smakfullt restaurert overnattingssted eiendom i første etasje i en tre-etasjers Roman og Medieval hus rekonstruert i det 17. århundre, bare 20 meter fra den vakre viktigste piazza av Todi i Umbria, Italia. Det har blitt fullstendig oppdatert med et moderne kjøkken del komplett med komfyr, kjøleskap og oppvaskmaskin, stue / spisestue, soverom og bad. Spisebordet plass til fire. Trådløst internett -Tilgang. Leiligheten-Todicenter er perfekt for en eller to personer. Som i mange umbriske kunstbyene, tilbyr Todi mye gåing muligheter med flott utsikt og interessante historiske funksjoner, for eksempel restene av etruskiske og romerske townwall, kirker og bygninger, og et interessant museum. Todi er også den innfødte byen Jacopone, den første italienske poeten født i det 12. århundre. Todi blir ofte kalt "City of Jacopone '. Sublime accueil de Jens, d'une infinie délicatesse, toujours de bons conseils pratiques et culturels. L'appartement, particulièrement propre, est remarquablement éclairé et lumineux, très reposant, très très bien équipé pour y vivre confortablement et cuisiner, idéalement placé, à deux pas de la place principale et du Duomo, au cœur d'une cité magnifique. A recommander chaleureusement. Salut Jean_Claude, vous ètes les bienvenues! Clean, comfortable and perfectly located! Our daughter, son in law and children live in the historic center of Todi, and we wanted a place very close to them. This apartment was perfectly situated, just off the Piazza di Populo. There were only 5 steps to the front door (unusual in a town that is built on a hill). The windows opened onto a quiet alley, and the bed was comfortable, so we slept very well all week. The kitchen/living room was well equipped, although a couple of extra glasses would not go amiss. The bathroom was modern and there was plenty of hot water. It is a very old building, but has been very well restored, and is all on one level, except for the bathroom, where there is a deep step up, and then a shallower step down to access the toilet. I only mention this as it might be difficult for a handicapped person to manage, but we had no trouble dealing with this. Being only steps from the Duomo and the main square of Todi made it very easy for us to frequent the many coffee and gelato restaurants on and around the square. Our favorite, which was a little further away was Pianegiani, which, although not on the main square, had a delightful little piazza on the side. Our host, Jens, was most helpful, guiding our car through the pedestrian area so we could unload the luggage, then advising us that we could buy multi-day parking passes at the parking lot at the bottom of the ascensore. This is definitely the best place to park, since parking in the town is pretty much reserved for residents. The funicular from the parking lot to the to of the hill runs constantly and is free. I heartily recommend this apartment, and we hope to stay there again, the next time we visit Todi. 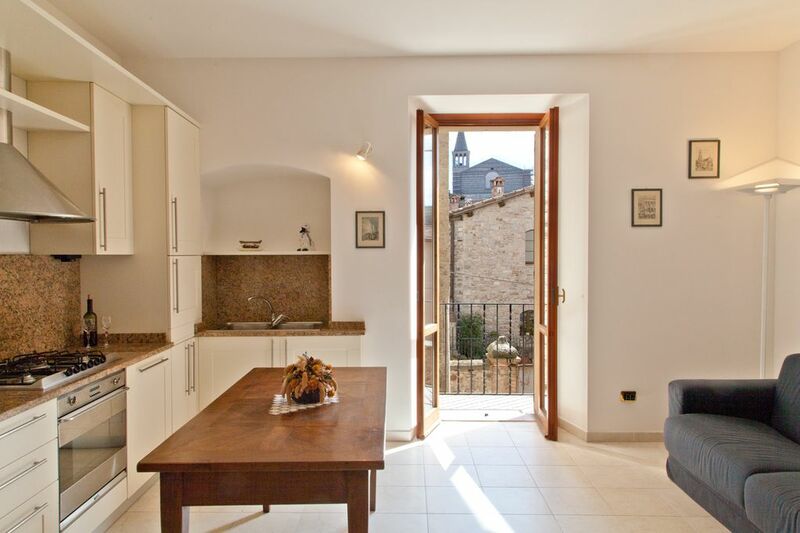 Very nice apt in the heart of Todi. Very clean and nicely equipped near all services. The plus value of our stay was the friendliness and kindness of the hosts . Village located within driving distance of all points of interests. You've been wonderful guests and we look forward to seeing you again. Siamo stati pochi giorni fa in questo appartamento, veramente molto carino, pulito e tutto ben sistemato, completo di tutto: dai bicchieri ai piatti, alle coperte ecc. ecc. E poi è a 2 passi dalla piazza principale, dove ci sono bar, tabaccai, e la navetta per spostarsi nelle zone limitrofe. Ma la cosa più bella è aver conosciuto i proprietari. Due persone veramente squisite e disponibilissime, con le quali abbiamo condiviso bei momenti assieme, tra chiacchere, cibo e scambi di esperienze. Lo consiglio vivamente per passare giorni in completo relax.